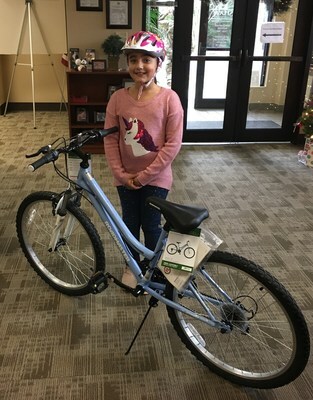 CHICAGO, Dec. 21, 2018 /PRNewswire/ -- Hunt Heroes Foundation (HHF), Hunt Military Communities Mgmt., LLC ("HMC"), nonprofit organization and BrightView Landscapes, the nation's leading commercial landscape company, recently partnered up to give 50 lucky military children new bicycles and helmets just in time for the holiday season. All 50 of the bicycles were generously donated to the HHF from BrightView, a partner of HMC on many of its properties. 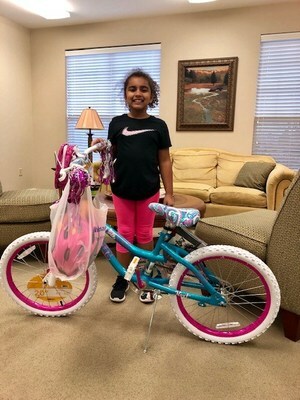 "BrightView was truly honored to donate these bicycles to the Hunt Heroes Foundation," said John Chapman, BrightView Regional Key Account Manager. "These bicycles were purchased by BrightView and assembled as part of a team building exercise for our employees. We knew we wanted them to be put to good use so donating them to military children, through the HHF made a lot of sense." 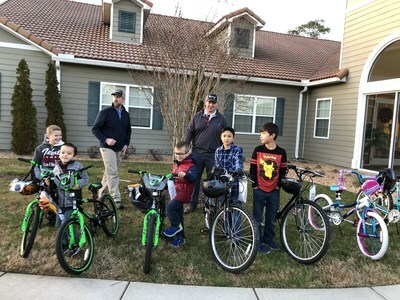 The bicycles were given away as part of a contest where military children, under the age of 16, had to write an essay on what it meant to be the child of a service member. Nearly 200 entries were received from almost every Hunt property nationwide. "The judges had an extremely hard time narrowing it down to 50 winners," said John Ehle, Hunt Heroes Foundation President. "There were so many good, heart tugging essays that we really wish each person who entered could win. We are so grateful to BrightView for their generosity and for helping make so many children's holiday a little brighter this year." "I am thankful for being a military child because I love my dad and he is in the military. I love him but sometimes he hast to leave to help or save people around the world." Zyla V. Floyd, 8 years old. "My dad is in the military. He goes to far away work for a long time. It means we don't always get to spend holidays together. It mean I have to be brave for mom when he is not home. It means when other kids have their dad for the holidays mine may have to work. But when my dad is home is super special." Allen Corban, 8 years old. "For me, being a military child is sometimes not so easy. It takes a lot of work to be in the military so there's a lot of times when my dad is gone. But, I know that he is doing good work, and that he is always there to take care of me, even when he's not right there next to me." David Potter, 15 years old. BrightView is the largest provider of commercial landscaping services in the United States. Through its team of approximately 20,000 employees, BrightView provides services ranging from landscape maintenance and enhancements to tree care and landscape development for thousands of customers' properties, including corporate and commercial properties, HOAs, public parks, hotels and resorts, hospitals and other healthcare facilities, educational institutions, restaurants and retail, and golf courses, among others.